As you may or may not have noticed, Andy’s Appliance Repair just got something of a make-over in the website department. Actually, it might be better if you hadn’t noticed because that would probably mean that you’ve been coming to our website fairly frequently, meaning all of your household appliances have been breaking at once. We don’t like imagining that scenario, despite the fact that it could mean more business for us. Ultimately, we are part of the Omaha, Lincoln, and greater Nebraska community and regularly coming face to face with our customers’ mini-crises is no fun to witness. What is fun to witness is being able to help affordably and efficiently fix the issue on the same day that we received your call. In fact, that is a hallmark of Andy’s Appliance Repair. We make a point to do our very best to get out to where you are, arrive promptly, and repair the appliance on the spot. That isn’t always the case, but just know that we make a point to make it the rule, as opposed the exception. If you are asking yourself, “I thought this was an article to help me fix my freezer, or at least get a starting point so I can figure out what might be wrong with it”, our reply is, firstly, that is a valid point. Secondly, as you will soon learn, most problems that have to do with fixing a refrigerator or freezer aren’t typically of the “handyman” type. Tragically (not for us, it keeps us in business), there aren’t too many issues that can be resolved by just tinkering around with it or giving it a kick to reboot. Unless the freezer is unplugged. Start there, if you are wondering where to begin in the diagnosis of your freezer problem. 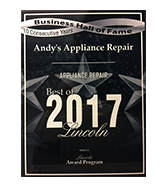 But back to our point about same day appliance repair service in Lincoln and Omaha and beyond! This can make a huge difference for our clients. Not only could it get their stress levels down and they can resume normal life, but it can actually save them money. Consider a freezer repair, since that is our topic today. Instead of having to throw out $100 worth of food because it thawed before the other repair guys couldn’t make it out on time (or they just didn’t show up until they felt like it), your trusty Andy’s Appliance Repair technician punctually arrived a few hours after receiving the call. 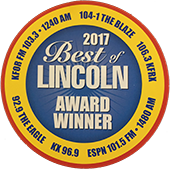 Throw in the fact that our rates are very affordable, and we act respectfully when in your home, and you might be able to see why we have been a mainstay within the Nebraska community since 1971. Being in business that long in a community like our is no coincidence. It is the direct result of doing business the right way, so that people remember who they can count on the next time they need refrigerator or freezer repair service. 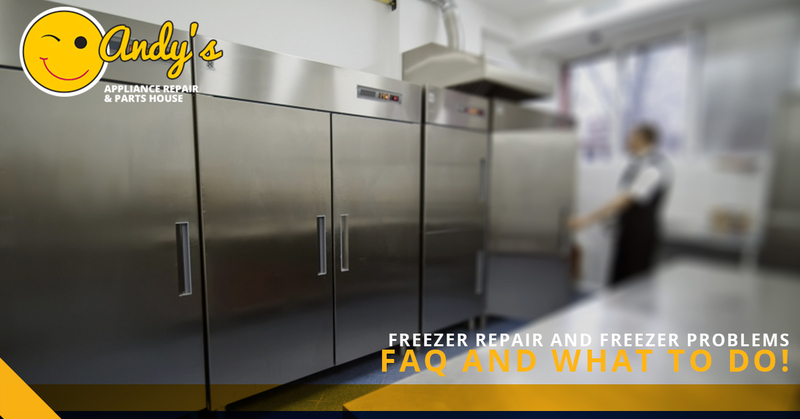 Now that we’ve bragged about ourselves a sufficient amount, let’s actually discuss common freezer repair issues, what you can do about it, and even some preventative steps so that you don’t find yourself in this position again any time soon. Freezer Frost Build Up Got You Down? While this isn’t strictly a repair issue, it can be a hassle. If your freezer isn’t of the self-defrosting variety, you can expect some natural frost to occur. A good rule of thumb here is to not despair about the frost, but to let your freezer thaw out a bit if the frost build-up starts protruding more than a half-inch. Easy fix! Just be sure to eat all of those chicken pot pies and ice cream sandwiches beforehand – you don’t want the kids coming home from school only to find their favorite treat has melted before their eyes. That has disaster written all over it. Since the dawn of time, men have had electrical freezers. We all know this. This much is established. What is less established is how to deal with the ancient and perennial trauma of dealing with freezer burn, particularly on those kid’s delicious ice cream sandwiches. But, luckily for you, the solution is at hand. Freezer burn is actually just dehydration in your favorite foods, caused by food coming into contact with the air in the freezer. It can get pretty dry in there. And with the way ice cream sandwiches are packed these days (a shocking amount of care), there is little those guys can do from crystallizing and becoming less tasty. All you need to do to sidestep the issue is to re-wrap the food in an airtight container. Even though that is a hassle. If you aren’t into that and would rather suffer through the dry, anti-creamy sandwich, feel free to do so. It’s perfectly safe. That’s a problem. We, at Andy’s Appliance Repair have solutions for that problem. But without getting down and dirty with the freezer there isn’t a good possibility we would be able to lay out a specific game plan to fix your freezer. But we might be able to point you in the right direction with some of these common causes. The Condenser Coils Are Dirty – Condenser coils that are found within your freezer walls don’t need to be cleaned. But if they are behind or under your unit, they’ll need to be cleaned every six months to a year. This is actually a great tip if you don’t feel like giving Andy’s Appliance Repair a call a LOT sooner than you need to. This is because if the condenser coils get dirty it significantly inhibits your freezer’s ability to do what it does oh so well – freeze stuff. Go ahead and clean them, anyone can do it! Start Relay – “What’s a start relay, Andy?” Believe it or not, we aren’t all named Andy, here at Andy’s Appliance Repair…although it would be pretty cool/creepy if we were. Back to the point, a starter relay, or a compressor start relay, that doesn’t work can have the net effect of keeping the compressor from running. Again, this means the freezer won’t cool. If you are equipped and know what you are doing, you can use a multimeter as to measure the start relay for continuity between the start and run terminals. But, then again, if you are equipped and capable, you probably already knew that. So just give us a call for all of your freezer appliance repair needs, regardless of brand, age, or issue. Evaporator Fan Motor – This handy contraption pulls in air over the evaporator coils and then circulates it all over the freezer, which, namely, keeps ice cream sandwiches cold. If you want to check and see if that is the issue, open up your freezer door, activate the freezer door switch, and check to see if the evaporator fan motor is running. If it isn’t, there’s your sign that you need a new evaporator fan motor. Whether you want to double check and get some more experienced eyes on the situation or would prefer to have Andy’s Appliance Repair order and install the new part, give us a call and we will work out the details! It’s been a wild ride today, folks. But we hope that you’ve found this article as entertaining as it was useful. 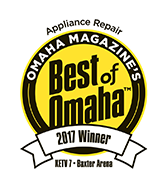 In all seriousness, we are proud to be part of Nebraska’s community, providing Omaha and Lincoln with a range of appliance repair and part installation services. If you are in need of same day service on your freezer, refrigerator, or dishwasher repair, give Andy’s a call for reliable, affordable, and punctual appliance repair service. 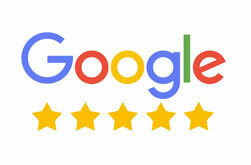 We would love to earn your trust and save you money while we are at it!